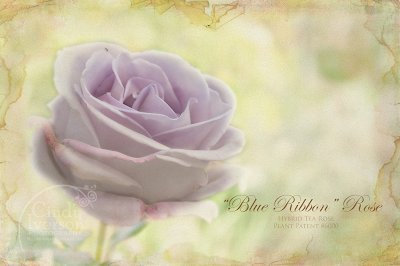 Rosehaven Cottage: Creation of my "Rose Nostalgia Collection"
Since the majority of my roses in the garden were developed or introduced long after the era of the vintage botanical print, I thought it might be a fun idea to take some of the photographs I've shot of my roses in bloom into Photoshop and see if I could create images that looked like vintage botanical prints. 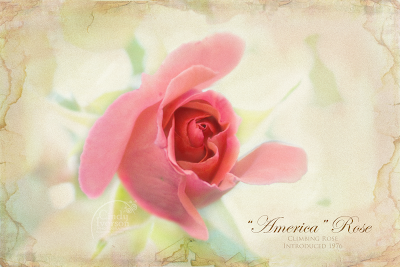 I started out with the "America Rose". It's the one I did all my experimenting with to find the right process for making this idea happen. Thankfully, a Flickr friend of mine (playingwithbrushes) has a wonderful set of free textures on Flickr that she's photographed and scanned from around her farm and home. Included are some old book pages that she's scanned. They're perfect for what I wanted! 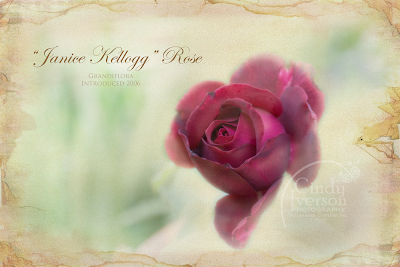 I'm calling these images my "Rose Nostalgia Collection" and I'm planning on doing one for every rose variety in my garden (except the mystery roses that I can't identify). It's a real treat to transform these photographs and watch them turn into vintage illustrations with the use of the modern technology of Photoshop and my Wacom Cintiq 12" digital tablet. and, instead, to emphasize sharing it for free via the digital image online. Click here to visit my Flickr page for more images for you to enjoy for free. for the price of shipping to your location anywhere in the world. The vintage roses are soooo lovely! these blooms on paper are beautiful. it is so much fun to get to play on the computer and make things the way we see them in our creative mind. very nicely done. They are gorgeous! 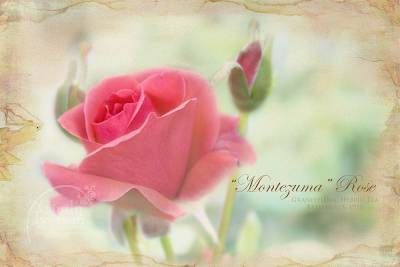 I especially love the Montezuma rose! what a marvelous gift you have! It's so amazing what can be done with Photoshop, but of course there needs to be a good bit of talent behind the software :) You've done a gorgeous job with there! What a great idea Cindy and the execution is not bad either. ;-) I can see that you are getting better and better at it with every new rose you used and it's also clear that you were enjoying yourself while doing it. Always a plus that. Oh, Cindy, these are beautiful~ I love the colors and textures. You've done a beautiful job. Most of all, I want to thank you for the "fine print" sharing. What a wonderfully sweet thing to do. Beautiful as usual! They just look so delicate and soft. Makes me wanna smell 'em! I just love popping by your place. It's always such a gorgeous feast for the eyes. I always come away 'fed' in my soul. Thanks for the beauteous photos! Lovely Rose, I love it ! Cindy, how absolutely gorgeous!! They look old-fashioned and soft and wonderful. You are such a sweetie to share!! Have a great Vintage day, dearie! The roses are beautiful, my favorite is the "Janice Kellogg" rose, you did a great job making them look vintage. Cindy, what a great idea and a beautiful, soft, and feminine collection. So nostalgic and sweet! Cindy, I don't know if my comment just went through. I got an error message for some reason. This is a lovely, sweet, feminine and nostalgic collection. Very creative! Wow Cindy, those are just beautiful! You are just a font of creativity. This shows off the blooms in such a lovely way. They are so beautiful. I loved each and every one! Who wouldn't want to recieve one of these in the mail? They are very, very pretty note cards. Your talent once again shines through. These are amazing Cindy. You could make up a name for the mystery rose. These are wonderful Cindy. I especially love the Blue Ribbon one. To me it is everythign a rose shoudl be- timeless, romantic and so beautiful. you have captured that so well.